The rainy season in Bali is used to last from November to March with sometimes incursions in the dry season and vice-versa. This year the rainy season starts on time to the great joy of farmers and gardeners! 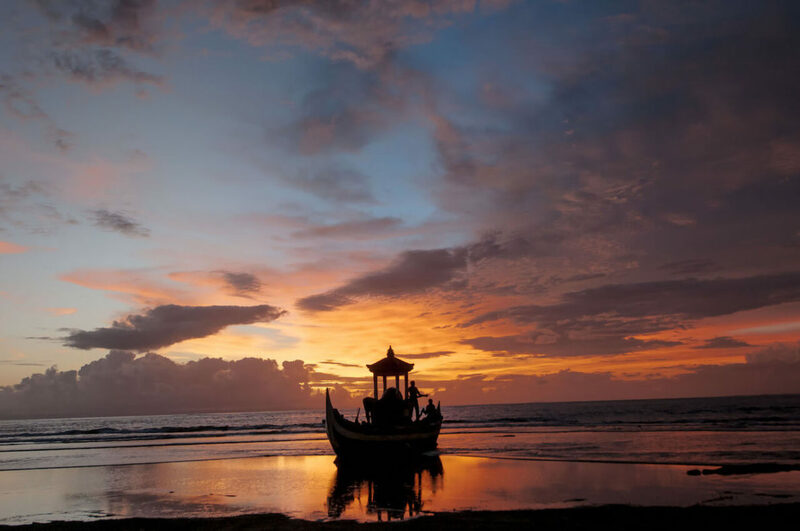 But the questions often asked by our guests willing to visit Bali are “Is it worthwile to visit Bali during the rainy season? How strong is the rain? How long every day? Is’nt it too wet?” Legitimate questions when they are going to spend hours in a plane to get here! First of all we have to keep in mind that raining in Bali has nothing to do with heavy rain we can meet in some South East Asia countries such as Thaïland. In Bali, there is no monsoon. The answer is also very depending on where you plan to stay in Bali. Close to the mountains you will get more rain than on the coast. In Dajuma, the rain falls only a few hours every day, often in the night and the consequences on the nature and your stay are more than positive: flowers blooming and green grass everywhere in the garden, no dust, wetness limited by the breeze from the sea, and, cherry on the cake, contrasted skies offering breathtaking sunsets as shown on the picture. What could we dream of better?